Parodies and animated spoofs of the popular videos are quite common these days, but here is an epic video in which Prime Minister Narendra Modi is dancing for a song, and the song itself is sung and penned by him. This compilation of the various acts with bumpy Punjabi music will make you laugh for the whole day. the parody video is uploaded by a popular facebook channel ‘Peeing Indian’ and is now going viral on the Internet leaving people to roll over the floor laughing. According to this video featuring Modi, the lyrics simply suggest people party, eat and have fun, which in locale said ‘Khao, piyo, aish karo, mitron’. 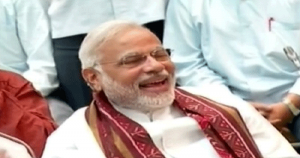 Meanwhile, this video is flooding the users’ timelines with the hashtag #Modifiedsongs. The video already garnered more than 3,30,000 views and shared by 7291 users till now.